Recently we were visited by Ben Eagle, an environmental and agricultural writer for Thinkingcountry; a platform that engages with big and small issues related to food, farming, conservation, nature and countryside. ‘Meet the Farmers’ is a new audio podcast series on Thinkingcountry. 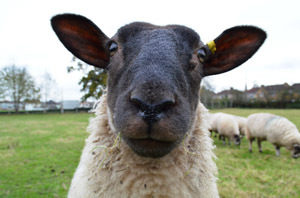 The series aims to highlight the realities of running a farm in the UK and each episode will profile a different farm, looking at the enterprises and interviewing the people that work on them. Ben hopes that the series will highlight the realities of farming life, the good times and the bad, as well as farmers’ hopes and fears for the future. The first episode was recorded at Stowford Manor Farm near Trowbridge in Wiltshire, and Elm Tree Farm is thrilled to feature in the second episode. 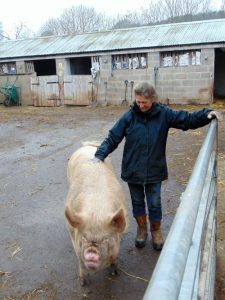 When Ben first approached the Farm, manager Keily Elvin was a little unsure if Elm Tree Farm was quite what Ben was looking for. Even though we produce and sell quite a range of products and produce, our primary role is one of a Care Farm rather than solely a commercial one, but Ben was really keen to feature a Care Farm in the series to show how much diversity there is in the farming community. On the day of the visit it was business as usual. Ben and Keily talked at length about the history of the Farm and how things have changed over the years, before walking around each of the projects to meet the staff and people we support. Everyone was really welcoming and keen to talk about the Farm and what they do to contribute to its running. We could probably have kept Ben talking all day! 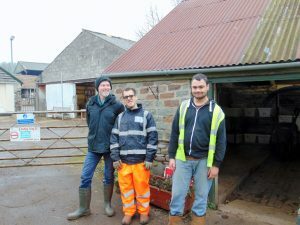 At the end of the visit Ben commented a number of times on the passion that was evident from talking to everyone on the Farm, both staff and trainees, and how it must be a great environment to work in. Indeed there is a great feeling on the Farm, one of positive enthusiasm that makes it a great place to be. To get an insight into life on our farm and a real feel for the great team spirit, take a listen to the podcast. Thanks for visiting Ben, we think it’s great. It was a pleasure to feature Elm Tree Farm on Meet the Farmers. I had a wonderful day and thank you Keily for showing me around. It is very true that there is much diversity within the farming community and care farming sits within this. Wishing you all the very best for 2017!